Fasco has created an excellent framing nailer that give you the option of using Scrails and doesn't break the bank. I’ve been building for years, but I’ve never used a Fasco product. Until now, I’ve been content with my reliable Hitachi nailer to help me frame out the bones of one structure after the next. Well, today I’ve got my hands on the newest Fasco Framing Nailer and Scrailer. Fasco, originally an Italian company known for their innovative fastening solutions, gives their F58A RHN20-90C SCR the ability to use traditional 21° strip nails or the brand’s proprietary Scrails, a half screw, half nail. While I hope to have a project that will put the Scrails to the test in the near future, I’ll be sticking with good ol’ tried-and-true nails for this review. Fasco’s latest edition of the nailer/Scrailer does pretty well across the board, though we did have some occassional jamming. If there’s even a chance you’ll work with Scrails, this is a solid Pro model that can be your primary framer and Scrailer. Now, I love my Hitachi nailers, and I’ll admit that I wasn’t inclined to just let the Fasco Framing Nailer and Scrailer replace it. I’m sure a lot of guys feel the same way. But this Fasco framing nailer has won me over, and there are some good reasons why. My church recently purchased a sanctuary and offices from another congregation. This space will be a real blessing for us, but to meet our congregation’s particular needs, we needed to rebuild it. Using only the existing floor and walls, we’ve had to start from near-scratch with it. Our vision for the sanctuary calls for platforms and partitions galore, and so I used the Fasco framing nailer to help me get the job done. The handle includes an appropriate amount of contouring, and the rubber overmolding on the handle helps the gun to feel comfortable and secure to hold onto. It weighs about the same as my other guns, and working for an extended amount of time didn’t seem to cause any undue fatigue. As a matter of fact, Fasco claims that this gun is 12% lighter and an inch and a half shorter than their previous model. Since this is the first Fasco product I’ve ever held onto, I have no point of comparison. But it weighs in at 7.84 lbs, which is comparable to my Hitachi. How does it fire? Does it feed smoothly, or does it jam up? 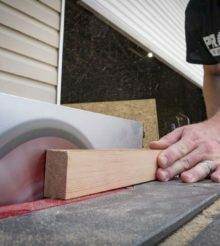 I didn’t expect the Fasco Framing Nailer and Scrailer to feel as good as it does, or for it to operate as easily as it does. It did jam a few times throughout the job, but clearing the jam with the magazine release is quicker and easier than some of the competitors out there. Like all Pro-level framers, this Fasco Framing Nailer and Scrailer includes both single fire and bump fire modes. Fasco has an interesting mechanism that’s completely new to me. Instead of switching triggers (I hate that) or a push in and turn switch, this uses a pin that you flip in for bump fire and out for single. It’s red so it stands out against the black and silver materials and really is easy to use. Pro Tip: To switch modes, you need to press the trigger in. Be sure you’re not connected to an air supply when you flip it. I used bump fire most of the time. Every so often, the gun double-shot, but I think that has more to do with late-day mental errors than having a problem with the gun. Sometimes the double-shot nail fires off at an angle and sticks in the plastic guard near the nose. These plastic guards prevent collation material from flying around, but I think most of us find them more problematic than helpful. Personally, I take the guard off to start with and stick with safety glasses. I really like the metal guard/bumpers on each side of the nailer’s head. Nailers, and any tools on the jobsite, inevitably get beat up no matter how careful you are. These guards offer an extra layer of protection against the bumps and drops that can happen. Additionally, the Fasco Framing Nailer and Scrailer features all-metal internal parts to help improve the overall durability. As far as criticisms go, I actually don’t have many. Aside from those occasional jams, I did hear a little air leak out of the exhaust at one point. After oiling it up, it seated better and didn’t present any more issues. Pneumatic and cordless framing nailers range in price from about $199 to $399. Although the Fasco didn’t participate, you can see a large cross-section of available nailers in our recent shootout. The Fasco comes in at the low end of the range: $199 without a hook and $209 with a hook. After starting off being skeptical that I’d ever pick up the Fasco over my Hitachi, I’m actually considering it. I don’t think I could ever completely give up on my go-to nailer, but if I ever come across a project that calls for the Scrails I haven’t had the chance to use yet, I certainly won’t complain! Taylor Goldsmith is a contributing writer for Pro Tool Reviews Magazine and handles project management for Goldsmith Construction.